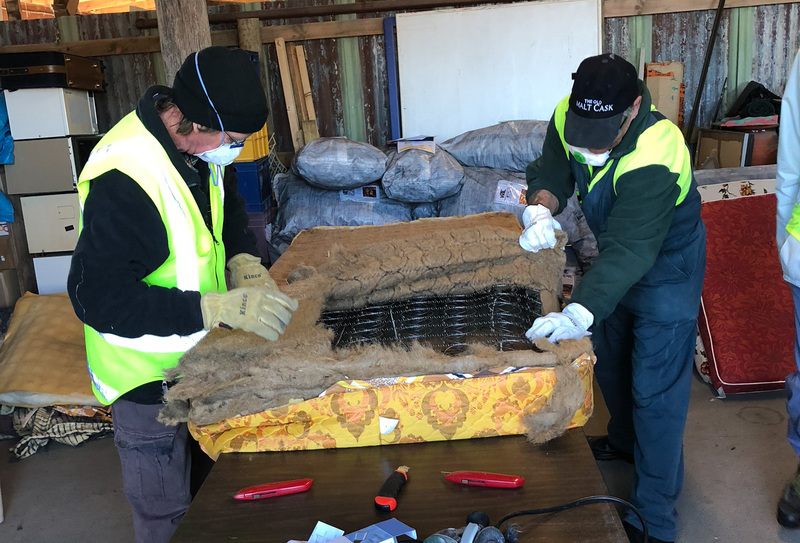 Timaru residents have become the first in the country to be able to recycle their unwanted mattresses after collection sites for the Rebound programme opened in the region today (27 July). The programme, designed by resource recovery experts 3R Group, sees mattresses collected, dismantled and the components recycled, with the aim of tackling the literal mountain of some 300,000 mattresses which go to landfill each year in New Zealand. Residents will be able to take their mattresses to the Temuka, Pleasant Point and Geraldine transfer stations or the Redruth Resource Recovery Park in Timaru, where they will be set aside for recycling. Timaru District Council Waste Minimisation Manager Ruth Clarke says that during the pilot period the cost will remain the same as taking a mattress to landfill as they will go over the weighbridge. The dismantling will be done by workers at the Sustainable South Canterbury Trust. The Trust, which runs the Crow’s Nest shop at the Redruth Recovery Park, will also collect mattresses from the three transfer stations, Ruth says. Rebound programme manager Sarah Clare says she is really pleased to see the pilot project kicking off in Timaru and working closely with community groups. One of the goals of the programme has been to provide employment opportunities and support local communities. Mattresses are one of the most problematic items in landfill as they are bulky and can clog machinery, Sarah says. However, the majority of components which make up a mattress, like the wood, steel, foam and coir (a natural product from coconut fibre with various reuse options) can all have a second life. The wood will be sold at the Crow’s Nest as is or made into kindling by the recently established Timaru Community Menzshed Inc., while the metal will go to a local scrap metal merchant. Keen gardeners will be able to purchase bags of coconut coir from The Crows Nest store to use as mulch or weed mat. Foam will be collected by 3R and can be repurposed in carpet underlay, or in other applications. Ruth says the pilot will run in Timaru as a 12-month trial to gather data, assess recycling options and review costs. Funding is being sought from the Canterbury Waste Joint Committee to subsidise costs. Should it be successful it could be rolled out to other Canterbury councils, she says. The Timaru District Council also offers child car seat recycling through the SeatSmart programme, which is also run by 3R Group.